Reflecting Cengage Learning's commitment to offering flexible teaching solutions and value for students and instructors, these new hybrid versions feature the instructional presentation found in the printed text while delivering end-of-section exercises online in Enhanced WebAssign®. The result-a briefer printed text that engages students online! 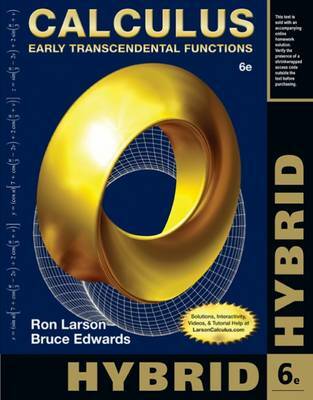 Designed for the three-semester engineering calculus course, CALCULUS: EARLY TRANSCENDENTAL FUNCTIONS, Sixth Edition, continues to offer instructors and students innovative teaching and learning resources. The Larson team always has two main objectives for text revisions: to develop precise, readable materials for students that clearly define and demonstrate concepts and rules of calculus; and to design comprehensive teaching resources for instructors that employ proven pedagogical techniques and save time. The Larson/Edwards Calculus program offers a solution to address the needs of any calculus course and any level of calculus student. Every edition from the first to the sixth of CALCULUS: EARLY TRANSCENDENTAL FUNCTIONS has made the mastery of traditional calculus skills a priority, while embracing the best features of new technology and, when appropriate, calculus reform ideas.